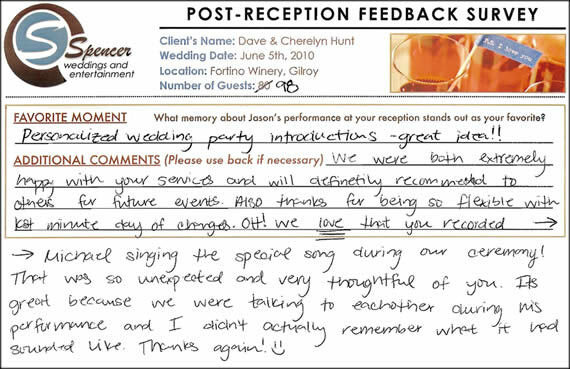 We were both extremely happy with your services and will definitely recommend you to others for future events. Also thanks for being so flexible with last minute day of changes. Oh! We love that you recorded Michael singing the special song during our ceremony! That was so unexpected and very thoughtful of you. It’s great because we were talking to each other during his performance and I didn’t actually remember what it had sounded like. Thanks again! 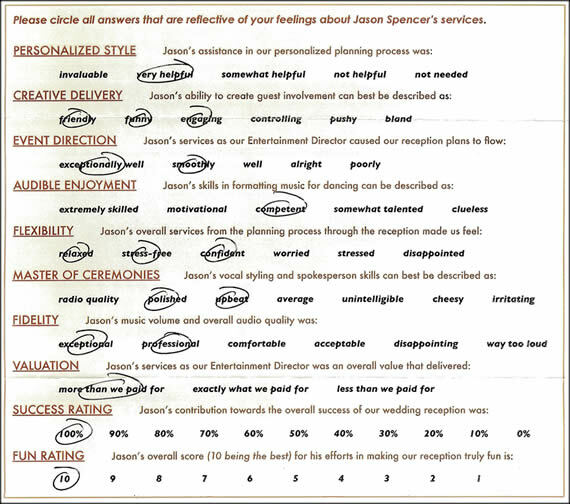 I have to admit, out of all of the vendors that we worked with, Jason was the one that made me the happiest. He responded quickly to all communication, thought of EVERY little detail that we forgot about, and really created the fun environment that we were wanting for our ceremony and reception. He is very creative, and added a personal touch to our event. Jason spent many hours outside of our actual wedding day, putting extra effort into the planning of our evening. I would totally recommend to any other couple, and for any other event in the future that we’d need his expertise. Definitely a good guy to know.